What is a value driver? It is a factor that increases the value and marketability of a business. Some value drivers are external, while others are internal. External factors such as extent of competition (both foreign and domestic), barriers to entry, economic trends, market size, and industry growth are variables that are beyond your control. The factors you can control—ones that influence the appeal of your business—are internal to your company. Have you ever wondered why some companies command a premium valuation at the top of the multiple range, while others fall well below the median? They pay attention to value drivers. Prepare your business by paying attention to the value drivers. The worst-case scenario is you’ll end up with a well-run company. As a business owner, your ability to positively influence the internal value drivers will directly impact the value of your company when it is time to exit. It is wise to work on internal value drivers to build the best possible business you can so that you are always ready to sell your company when the time is right. The following provides an overview of value drivers that require your attention as you strive to maximize the marketability and value of your business. We have compiled an assessment tool to address these value drivers with a rating system that will help to determine your company’s strengths and weaknesses. 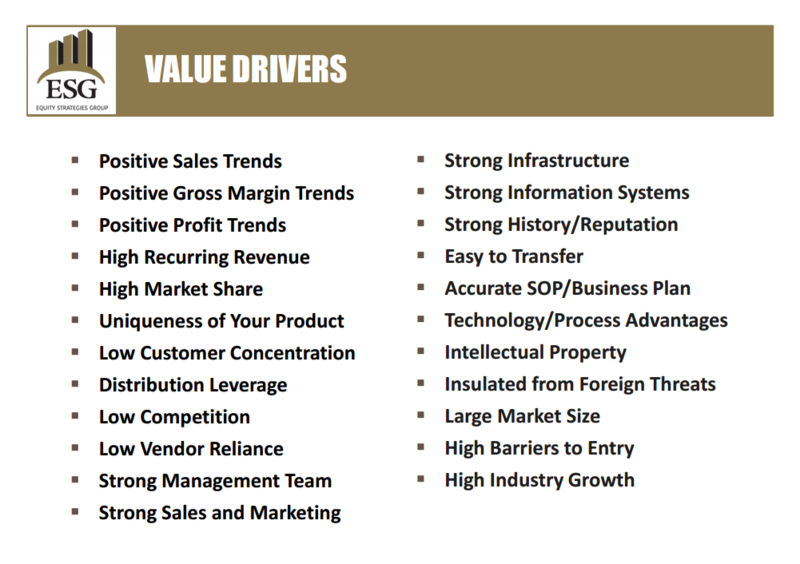 In preparing to sell your company, you must carefully consider these value drivers. Of course, there are many other factors and nuances that you also must take into account, but this is a good start. The goal is to get a picture of where your strengths and areas for improvement are. Please take a few moments to complete the Value Driver Assessment for your company.